My son loves the Tooth Fairy and it’s always a fun time when he loses a tooth. We’ve got a fun prize pack to giveaway and celebrate this fun time with children with The Tale of the Tooth Fairy. Each set includes a 10″ plush Tooth Fairy with a magical pouch to hold the lost tooth, a story telling the tale of how one fairy didn’t want to be like all the other fairies and became the first tooth fairy. In the back of the book is a Tooth Loss Record Keeper to record each special moment, and all packaged in a delightful book shaped house for the fairy to live while waiting for the next lost tooth. Enter to win below and good luck everyone! 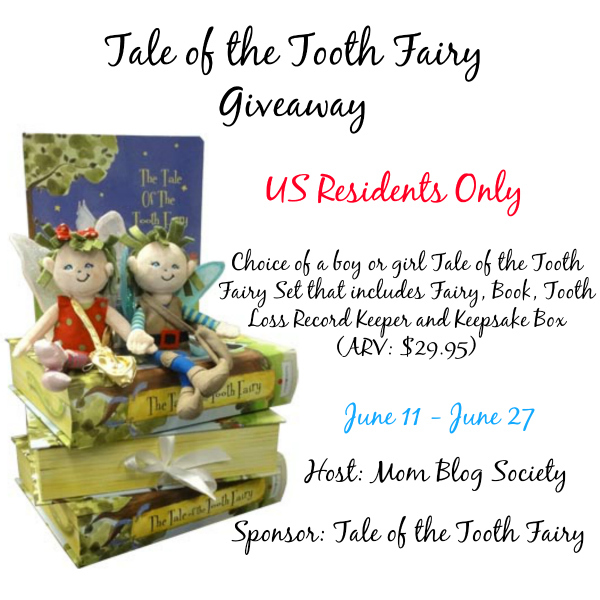 Giveaway is hosted by Mom Blog Society and sponsored by Tale of the Tooth Fairy. Enter on the easy Rafflecopter form below! Giveaway ends June 27, 2014 at 11:59 pm EST. Giveaway is open to US only. My kid is still getting her teeth in…but my niece is four and I;m sure she will be losing her teeth soon. this would be great for her. My kids were about six. My oldest grand kid is five so it should be soon. My children lost their first tooth probably when they were 6 or 7 years old. I would love this for my grandson. She was five years old and my son just list his first tooth at four! Got an email that said to return to my comment? My oldest son lost his first tooth when he was six and my youngest lost his when he was five. My son lost his first to at 6 years old. My daughter was around 6 I think. My daughter was 5 when she lost her first tooth. My sons were all6. My daughter was 5 when she lost her first tooth. Our oldest is 10 and he lost his first tooth when he was 6… our 4 year old daughter has a bit of time yet I hope!! My almost 5 year old daughter just lost her first tooth!